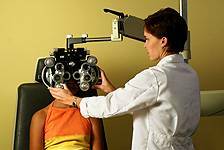 Home » What's New » Why Are Children’s Eye Exams So Important? Why Are Children’s Eye Exams So Important? Amblyopia, sometimes known as lazy eye is a condition in which a person has very poor sight in one eye because that eye did not develop healthy sight during the person's development. Several problems can develop that can seriously effect vision from childhood into adulthood if amblyopia is not diagnosed and treated in a timely manner. The weaker eye may develop a serious and permanent visual defect and depth perception may be lost. Contact Dr. Mackey today for more information, and to schedule your child's comprehensive eye exam.